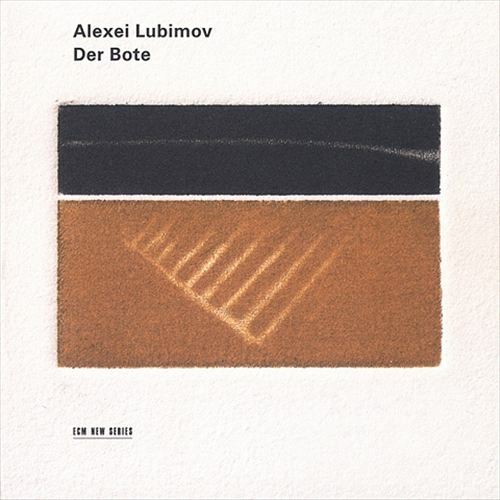 The title of Alexei Lubimov’s second recital for ECM translates as “The Messenger,” and perhaps no more fitting sobriquet could apply to the Russian pianist in this collection of ten elegies spanning three centuries. In opening with Carl Philipp Emanuel Bach’s Fantasie für Klavier fis-Moll, Lubimov provides something of a meta-statement encompassing all that follows. After a dream-like introduction, both musician and composer throw the listener for a loop with a burst of virtuosic splendor before returning to slumber. The music is rooted at the outer cusp of the Baroque while also far ahead of its time in scope and romantic flair, and pairs surprisingly well with John Cage’s In a landscape. The latter receives a uniquely spirited treatment here. Comparing this to Herbert Henck’s ECM recording of Cage’s early piano music, on which a slower read adds four minutes to its duration, one hears it rather differently. Lubimov’s playful undulations recast the piece’s depth of immediacy in quickly flitting shadows. Either way, it is achingly beautiful, a singular composition from a composer whose melodic humility remains unparalleled. The fumbling dance of Tigran Mansurian’s Nostalgia hints at revelry but succumbs to meditation, while the Abschied of Franz Liszt provides our steadiest elegiac thread so far that moves with the sway of windblown branches. Mikhail Glinka blots our vision with nostalgic hues in his Nocturne f-Moll “La separation,“ a faded photograph lost in the pages of a dusty book, in which one may pore over Frédéric Chopin’s Prélude cis-Moll op. 45. It is a tale of sorrow, fading in on the stagnant lake of an abandoned estate, long overgrown with neglect. Beam by beam the mansion crumbles, until fireflies take the place of the footsteps that once dotted its halls: a thousand years of history condensed into six minutes. The abstractions of Valentin Silvestrov’s Elegie are like the ghosts left behind, fractured through the passage of time and made visible by the glow of introspection. In the Elégie of Claude Debussy, we are distracted by a passing mysticism, swept by the wind into the light of daybreak far from our own. Alone and without recourse, we seek shelter in Béla Bartók’s Vier Klagelieder op. 9a, Nr. 1, finding in its sweeping gestures and impressionist fades the key to Silvestrov’s title work that finishes. A gorgeous deconstruction of Mozart in a kind of haunted chamber, it is a touch upon the shoulder from the afterlife. By its last note, one wonders whether it ever really existed. Lubimov is a pianist who understands music’s humble beginnings. He cradles every note like a wounded bird, nurturing it with grace until it is well enough to fly on its own. Equally intelligent programming makes this a disc to remember, if not forget like the memory of a past too beautiful to reproduce with any claim to faith. But this he does, and with a quiet passion that welcomes us with open arms.